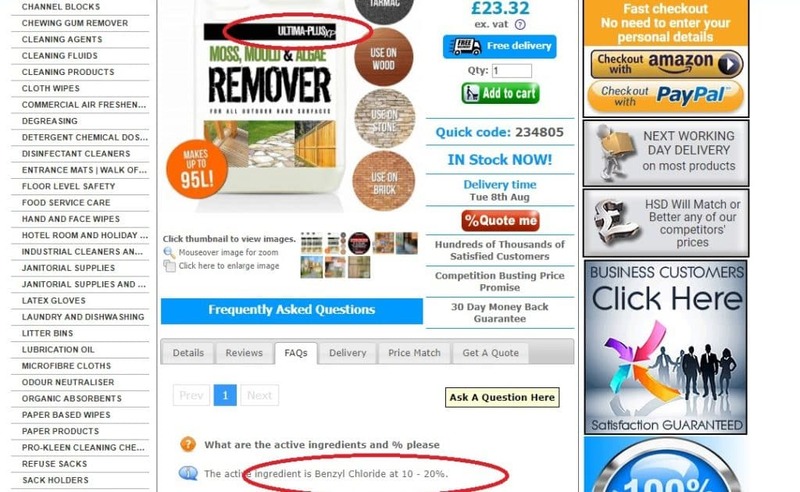 Are you looking for the most powerful and effective moss killing chemical you can buy in the United Kingdom? 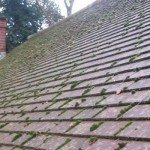 I spent 17 years working in the construction and home improvement industry and one of the most popular services I offered was a moss removal and treatment service, for roofs and patios. I’ve tried every moss killer chemical on the market and do you know what I found out? They all contain the same chemicals. The most popular chemical is called Benzalkonium Chloride (aka alkyldimethylbenzylammonium chloride). The other is Didecyldimethylammonium Chloride. 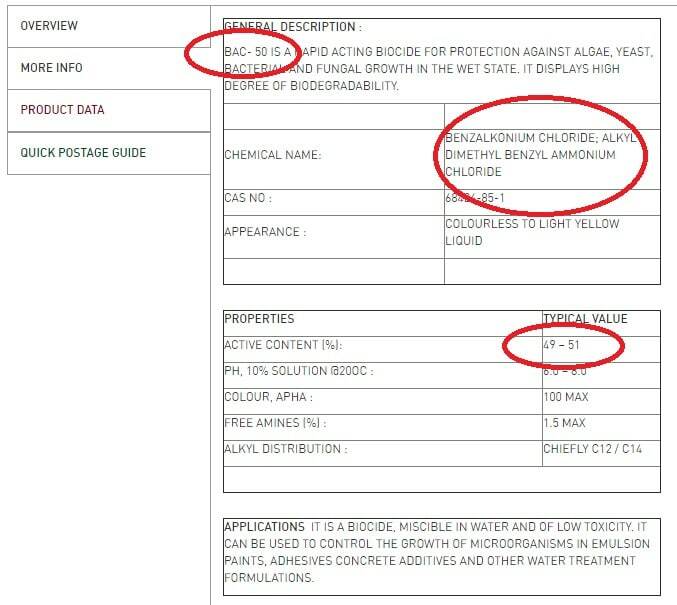 Every product on sale in B&Q, every trade store and every website I could find contained one of these chemicals as the active ingredient. If you want to buy a moss killer that’s affordable and effective at treating moss, algae and lichen, look no further. I’ve tried them all and this is the most powerful – and I can prove it! 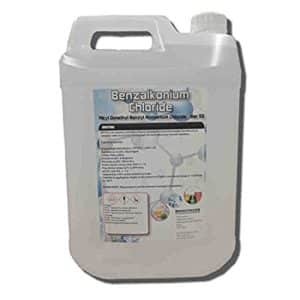 Don’t forget; Benzalkonium Chloride is also known as alkyldimethylbenzylammonium chloride. The only other product that is remotely comparable to BAC 50 is AlgoClear Pro which contains Didecyldimethylammonium chloride at 40% concentration. 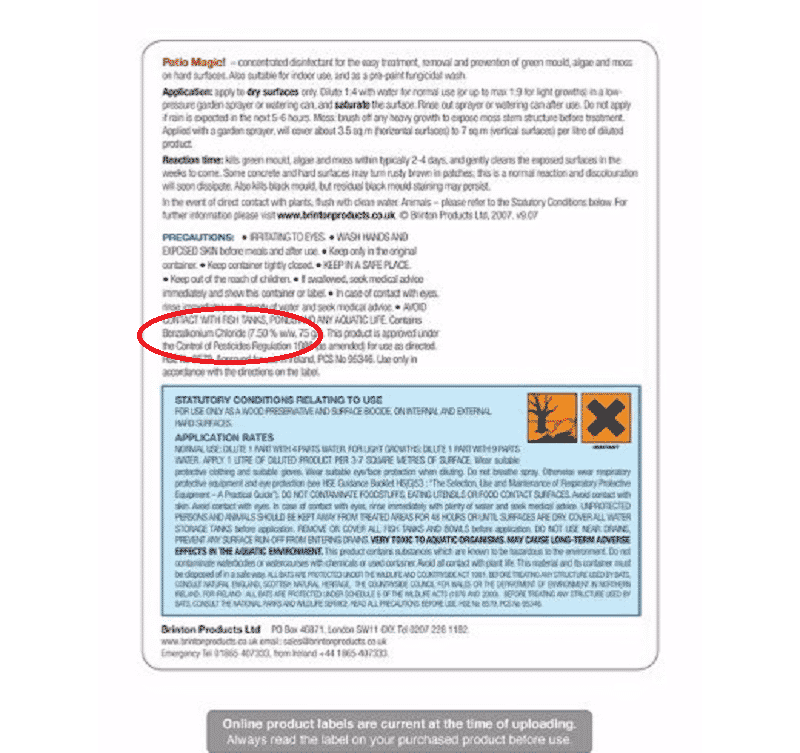 This is the professional product and should not be confused with AlgoClear for general use, which contains the same ingredient at a measly 10% concentration. I prefer BAC 50 as it’s cheaper per litre. 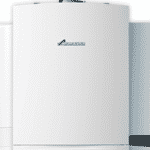 Also, AlgoClear Pro is only sold to tradespeople and businesses. Is BAC 50 Really That Powerful? I know because I spent several years using this on roof tiles to prevent the moss from growing back after I had physically removed it with a brush/scraper. Do you see the white and black marks on the tiles? These are lichens and are very difficult to remove, even powerful pressure washers won’t shift them. The good news is that Benzalkonium Chloride will kill them, but it requires some time to take effect. Keeping reading to find out more about lichens and how to best get rid of them. How Often Should the Chemicals be Applied? 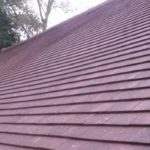 I’ve found that the chemical needs to reapplied every three years to north facing roofs and every 4-5 years on the sunny south facing side of the roof. The feedback I received from customers was very very positive. Several of them asked me to come back and treat their patios and driveways, even though I was a roofing contractor. For patios and other flat surfaces where water may puddle, you may need to reapply more frequently. For stubborn moss, algae and lichen on such surfaces, I suggest applying twice in the first year and then once per year going forward. 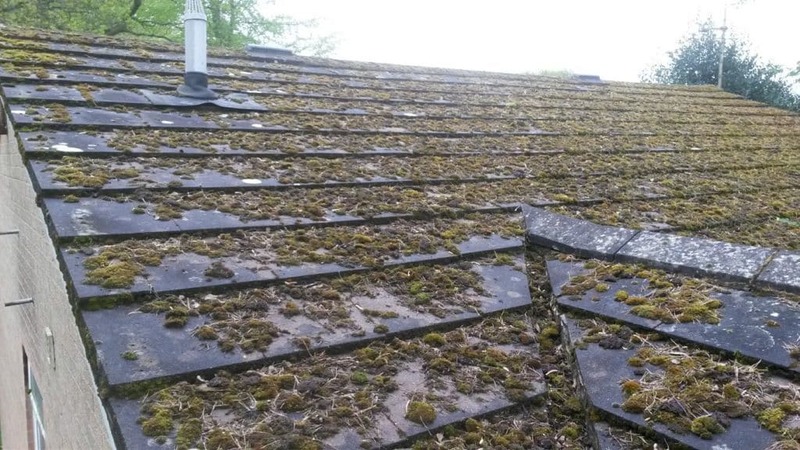 For any surface that is experiencing excessive moss growth (see photos above), first remove as much as you can manually without damaging the surface. You’ll then need to prepare the chemicals so use gloves and eye goggles for safety. Because of the high concentration, you should use extra care. This is not a ready-to-use product, it’s highly concentrated and may cause skin irritation. This chemical, like all similar chemicals, is very powerful in high concentrations but becomes inert once allowed to dry. I used a backpack sprayer for roof applications but for a patio, a watering can will suffice. The chemical is water soluble so mixes easily. A dilution rate of 25-1 (25 parts water to 1 part chemical) would produce a very strong product. For light algae growth, a rate of 40-1 could be used. This product is for hard surfaces only such as roof tiles, patios, driveways and fence panels. Test on an inconspicuous area first if you’re concerned about discolouration. This product should not be used on lawns or plants. Due to the high levels of concentration, this product is best used for large areas or stubborn moss, algae or lichen growth. Lichen is an organism that grows on hard surfaces like tiles and patios. It’s very stubborn and difficult to remove. Even powerful pressure washers struggle to remove this growth. 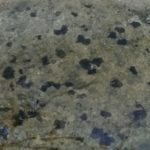 BAC 50 and other similar chemicals will kill lichen but it takes time for the dead matter to detach itself from the tile/patio. Just because the organism is dead, doesn’t mean it will suddenly disappear. 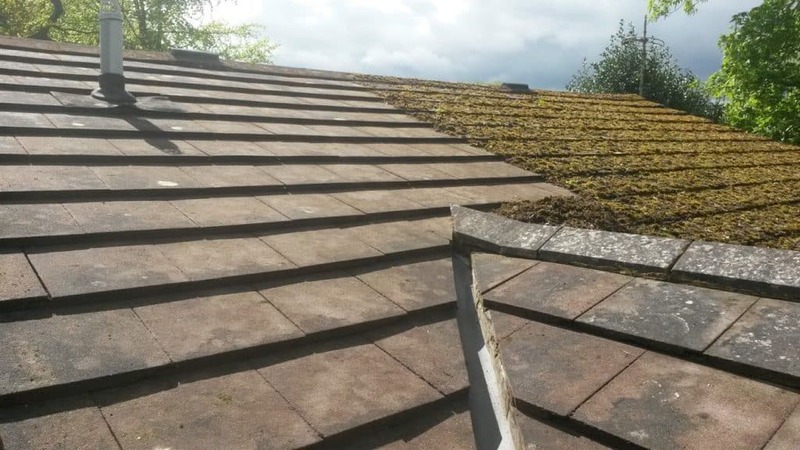 For roof tiles, I’ve found that rainfall and general weathering removes the dead lichen around 3-6 months after applying the chemical. For patios, it’s the same. The best way to remove lichen is to apply the strongest chemical you can find and then apply a good dose of patience.